Prayerbooks generally had calendars to help the user organise his or her prayers, like a modern diary. Each month would be set out, according to the Roman system of kalends (abbreviated 'Kl' at the top of the page), nones and ides, and would show the feast days, saints' days, and usually the zodiacal signs. The most important days were written in red ('red-letter days'). A prayerbook's calendar would often be custom-made, listing saints important to a particular person, church or region, a helpful feature in determining for whom or for what place a prayerbook was made. No one knows for certain where the calendar was made, but educated guesses include Leominster and Nunnaminster, Winchester. 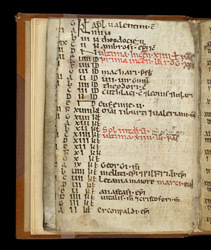 The Anglo-Saxon context of this calendar is evident in the Old English letter forms and its choice of saints. This page shows April and May: about mid-page 'sun in taurus' is noted. Other red-letter days are the days after Easter (which were moveable) and the feast of St Mark. The day before the feast of St Mark is the feast of Melitus, the first bishop of the East Saxons, and Wilfrid, bishop of York.